Wild Mammals of Wyoming and Yellowstone National Park provides the scholar, conservationist, and interested lay reader with information on the state's 117 wild mammalian species from grizzly bears to pygmy shrews. It describes the history of mammalogy in Wyoming, the zoogeography of Wyoming mammals, and the prehistoric mammals of Wyoming. It also characterizes the habitats of Wyoming mammals and addresses the conservation and management of mammals in the region. Expanding beyond the traditional field guide, Steven W. Buskirk emphasizes taxonomic classification, geographic range, and conservation status for mammalian species. Introductory sections are provided for each order and family, and individual species accounts organize a wealth of data ranging from habitat associations to field measurements in an easy-to-use format. 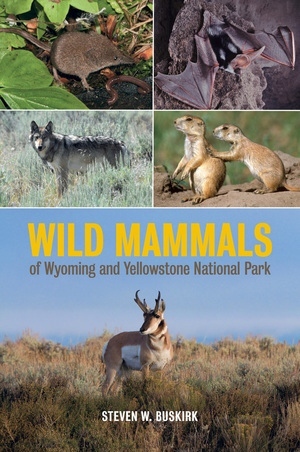 Featuring color species photos, continental and state-scale distribution maps, and a comprehensive bibliography with nearly 1,000 references, Wild Mammals of Wyoming and Yellowstone National Park is an indispensable resource for wildlife and conservation biologists and mammalogists working in this region. Steven W. Buskirk is Professor Emeritus of Zoology and Physiology at the University of Wyoming. His research has dealt with mammals from mice to bighorn sheep with a special focus on the ecology and conservation of medium-size carnivores and their prey. He has taught courses in wildlife management, mammalogy, and writing in zoology, and he has published articles in Science, the Journal of Mammalogy, and other journals. He coedited the volume Biology and Conservation of Martens, Sables, and Fishers (Cornell, 2012) and contributed to Species at Risk (Texas, 2005).